A wonderful new friend and amazing instructor of Egyptian Cooking, Marina of Cooking-Like-Cleopatra.com, who shared with great enthusiasm the exotic tastes and rich traditions of community to be found in Egyptian cooking. Food and community are synonymous in my world. Where each alone is a moment in life, the coupling together of food and community provide you memories to last. So volunteering to work at the Ludlow Food Festival, UKs original (and one of the largest) slow & local food featured Food Festivals, was a memorable weekend of delicious moments for this rucksack foodie! murderous plots of upheaval; modern day Ludlow’s royalty is of the epicurean kind with Michelin Star chefs, trend setting eateries, artisan bakers, craft butchers and sausage makers, locally produced cheeses, fresh seafood, a DAILY market square featuring over 25 stalls and not to mention Ludlow’s numerous historic pubs most of which are over 300 years old; It honestly is just a slice of British travel heaven. fabulous dining found in Ludlow. An original idea that was only a natural evolution considering the location of endless hillsides of orchards, rich agricultural soil, and beef and lamb as far as the eye can see. Ludlow has become a perfect epicurean utopia and kicked started the movement of food festivals for England (which there seem to be 100s of!) The event ran by a not-for-profit organization, generates over a £1million boost to the local economy each year with proceeds from the Festival supporting local charities as well as their own young food entrepreneur bursarys. 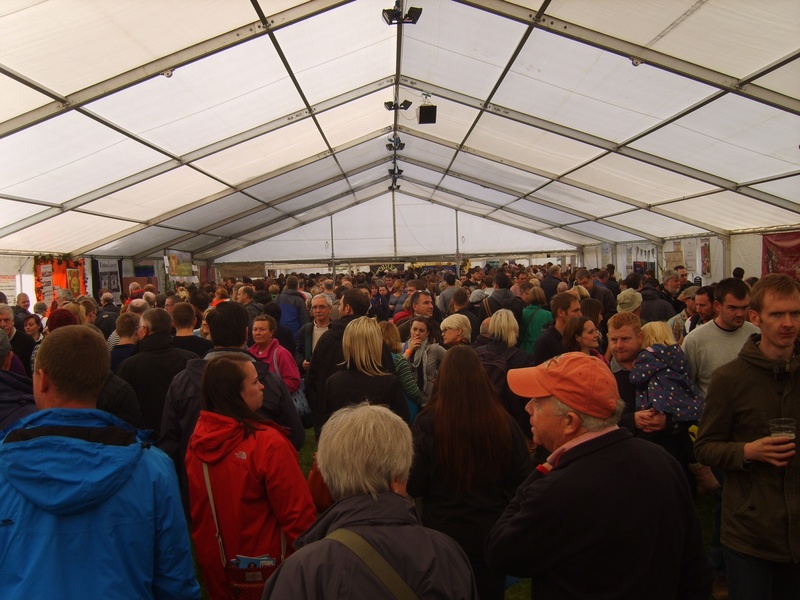 Just a tiny glimpse of the hordes of shoppers inside the GIANT marquee of food stalls. But somehow it was never a problem to maneuver about or chat with the sellers! 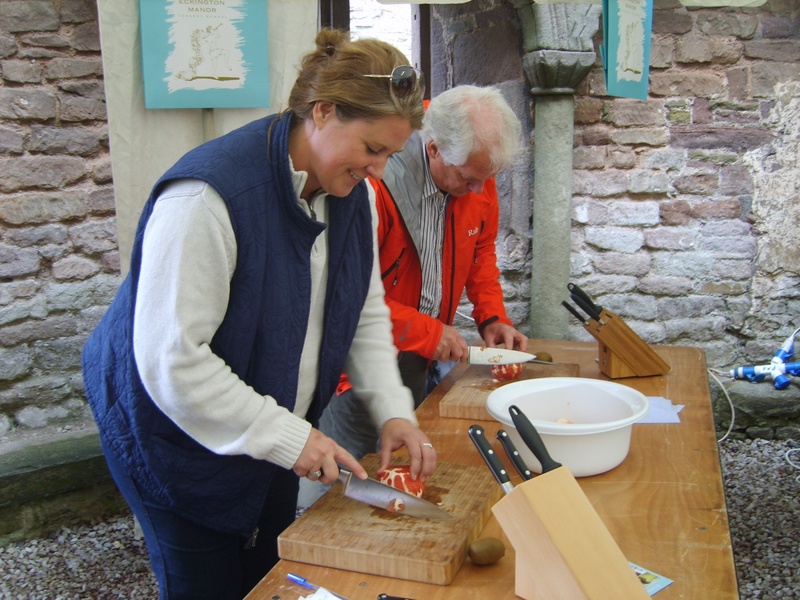 Although I volunteered Thursday through Sunday, the wonderful folks in charge scheduled me the Saturday morning off to explore the festival properly, so I took a long over due Knife Skills Course that was excellent! 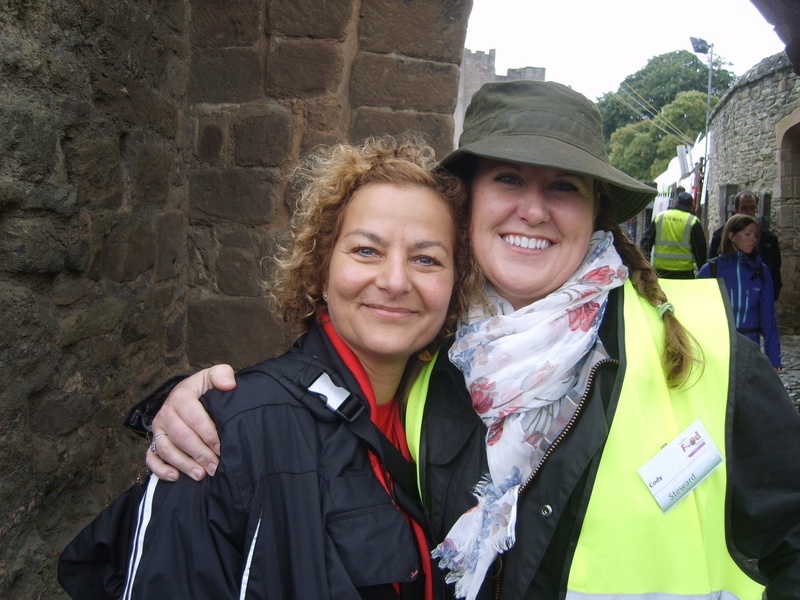 Over 100 volunteers lend a hand with set-up, stewarding and demonstrations to help make the Ludlow Food Festival happen each year. John, Liz and Stewart were all locals that volunteer a bit of time each year and were such a hoot to work hard with on set-up day! myself doing everything from setting up an endless amount of chairs, to assisting the lovely ladies behind the scenes on the Demonstration Stage, to helping with the fabulously fun and interesting Cooking-Like-Cleopatra MasterClass, to just wandering the stall marquee and grounds providing information and direction to the visitors. 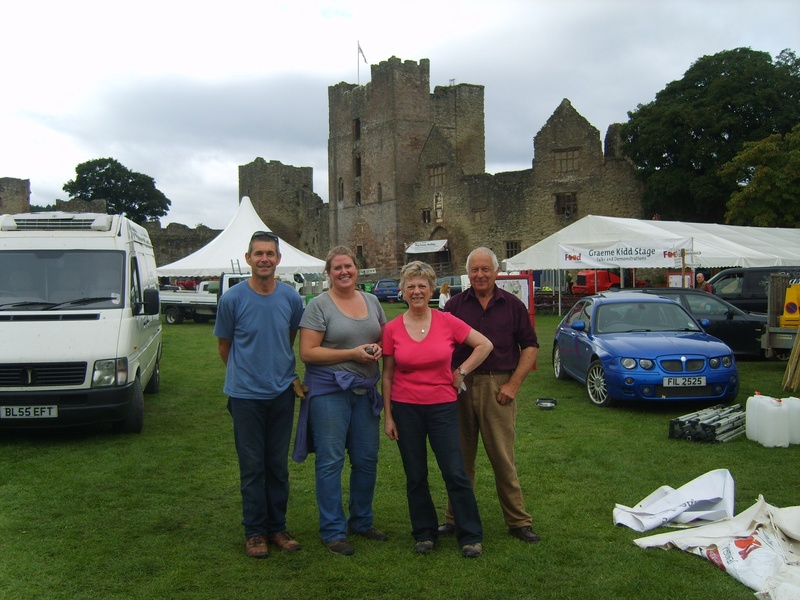 Beth, Phil and Vince of the Ludlow Food Festival Organizational Team made my time as a volunteer (and im sure all of the volunteer’s would agree) such a pleasure! The committee made sure to rotate schedules so that the volunteers had a great perspective and interesting day. They accommodated for needs and interest if necessary and they fed us all like kings and queens with a magnificent lunch buffet each day as well as tea with heavenly cakes provided throughout. The festival is a well oiled machine with so many aspects and individuals involved in making it happen that somehow comes together each year beautifully and seemingly flawless. 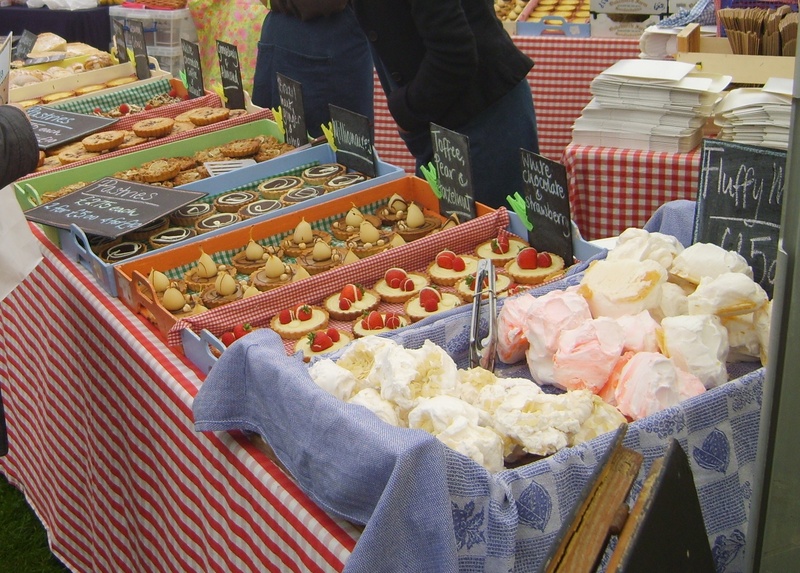 There are many (in fact hundreds) of food festivals in England now, but you MUST plan your trip to England in September with a visit to the Ludlow Food Festival, come hungry for both food and fun and I guarantee you will satisfied beyond belief! I also want to mention and give a big thank you to Sarah and Andrew of Whitfield House B&B who not only allowed this friend, of a friend, of a friend (otherwise a complete stranger) “camp out” for the weekend and making me part of their beautiful family while I was there. Whitfield House has luxurious and spacious rooms, a beautiful garden and the most gorgeous views of Ludlow castle to be found. Although there are many lovely places to stay within Ludlow, Whitfield House is most definitely the only one you’ll want to book for your visit ! Creative ticketing, as those lucky enough to purchase the Festival’s Sausage & Ale Trail tickets that lead to town receive their collectible beer mug on a lanyard as their eatery in around the town! The fabulously fun Cooking Like Cleopatra Class! Chef Paul from Eckington Manor Cookery School correcting all our bad knife habits in the very useful Knife Skills Course. This fabulous recycling idea from a local company reduced the event trash from 56 skips (dumpsters) to just 6!!!! AMAZING! My delicious souvenirs from the weekend! Tea and jazz in the castle moat . THE BEST CHEESE EVER !! Wonderful post, Cody! It takes me there … a place I’ve never been! And I know you regret not having more pictures, but the ones you share are fantastic. Thank you! Thanks so much, and definitely make a trip to Ludlow and this part of England as I promise you will not be disappointed !! Mouthwatering. Not only the food but the architecture. That looks and sounds fantastic! My mouth was watering as I read your descriptions and looked at the photos. Thanks Petra! Exactly what I like to hear!!! Btw…..delicious looking gluten-free desserts were abundant as well !!!!! I’ve never visited Ludlow but the local tourist office should use your post to advertise the ‘mouthwatering’ attractions. Very well done. Thank you Malcolm! I really appreciate your comment as I always walk away more enlightened after reading your thought filled posts! Hi Cody, as one volunteer to another – I agree with every word! It was great to meet you at the Wednesday night meeting than on and off over the Festival. Hope to see you back again one year? Thanks Carol! It was GREAT meeting you too!! Hopefully see ya in 2014! 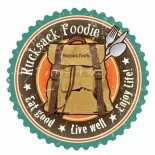 This entry was posted on September 21, 2013 by Rucksack Foodie in England, FOOD !, Friends, History, Libations, Travel and tagged Brecon Brewing, British Food Festivals, Cooking-Like-Cleopatra, Ludlow Castle, Ludlow Food Festival 2013, rucksack foodie, Volunteering on holiday, Whitfield House, Wright's Culinary Delights.